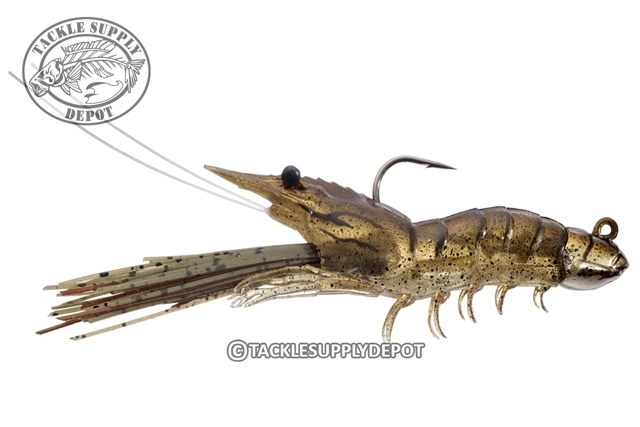 The LIVETARGET Fleeing Shrimp soft lure, bristling with three-dimensional anatomical features, is rigged on a custom jig head and armed with a strong, corrosion-resistant hook. The Shrimp's silicone skirt animates the lure's appearance by mimicking the action of a live shrimp's front legs while in motion and at rest. The Fleeing Shrimp combines realistic anatomy, profile, colors, sound, scent, and action to provoke aggressive feeding responses from inshore predators. Glass rattle. Shrimp scented. Comes with one replacement body.